Director Damien Chazelle is quickly making a name for himself as the rightful heir to the throne of dramatic cinema. Michael Myers and Laurie Strode deserve more in the new “Halloween.” When one thinks of the quintessential film serial killers, several names come to mind: Jason Voorhees, Freddy Kreuger, Leatherface, etc. An hour before Dartmouth Sings commenced in Spaulding Auditorium this past Saturday, the eclectic group of students and community members that comprise the Dartmouth College Gospel Choir were passing around brightly colored scarves and laughing. In anticipation of the College’s 250th anniversary, a group of Dartmouth faculty and students has teamed up to create “Hindsight is 20/19,” a 26-episode podcast series celebrating Dartmouth’s history. 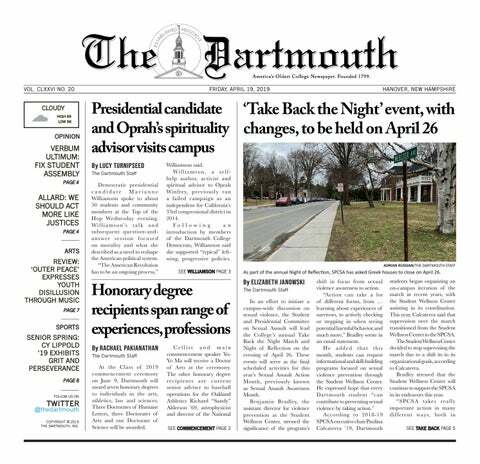 “It’s kind of coming out of the 250th, but also just out of a desire we’ve had for a long time to more widely share the cool stories that come out of Dartmouth,” head of Special Collections at Rauner Library Jay Satterfield said. Over the past two years, no band has had a more meteoric rise in the world of rock and roll than the Michigan quartet Greta Van Fleet. “You can’t heal someone who has gone through hell,” says Georgianna, a Wabanaki woman who is also the face of the documentary “Dawnland,” presented in the Loew Auditorium in the Black Family Visual Arts Center this past Friday. Airing in July this past summer, HBO’s “Sharp Objects,” an adaption of “Gone Girl” author Gillian Flynn’s book of the same name, sets out to remind its audience of what is unique to the identity of the Midwestern United States and what is possible within the supposedly limited format of the miniseries. Simultaneously making readers want to revel in the narrative as long as possible while also powering on to the end of the tangled story, “Providence,” by Caroline Kepnes is a novel about love and obsession, full of gripping emotional detail and a compelling New England narrative backdrop. The thriller begins in small-town New Hampshire, the day of Jon Bronson’s kidnapping. One of my fondest memories of my senior year of high school is when my English class read, performed and studied William Shakespeare’s epic tragedy “King Lear.” At that time, the play captivated me with its stark and honest portrayal of human fallibility and tragic loss and it quickly became one of my favorite works of literature. “The Front Runner” directed by Jason Reitman of “Juno,” “Up in the Air” and “Tully,” stars Hugh Jackman as U.S.